In June, activist Carmen Stone of Santa Fe traveled to the DRC to support Neema Namadamu and the Maman Shujaa, the “Hero Women” of Congo. Carmen will continue to support the Maman Shujaa’s movement for peace in the coming year through a practicum/internship with Alliance for the Earth, as she works to complete her degree at New Mexico Highlands University. 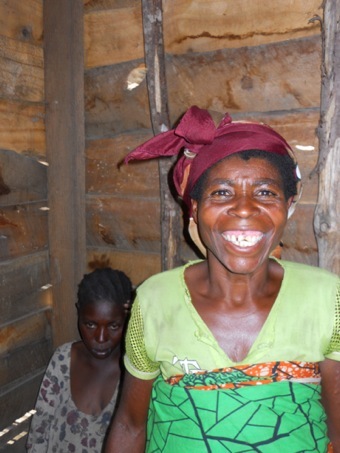 While in the DRC, Carmen Stone met with the women of the Kalehe Pygmy community. Her short video documentary, When Trees Fall, shares their stories about the impacts of deforestation upon their community. When Trees Fall will be shared at the International Women’s Earth and Climate Initiative Summit in New York City in September, 2013. Neema Namadamu will be presenting at this solutions-based, multi-faceted effort established to engage women worldwide to take action as powerful stakeholders in climate change and sustainability solutions. The Summit will welcome 100 women from the global community to further a women’s climate action agenda. Neema will join Drs. Vandana Shiva and Jane Goodall, along with many other grassroots leaders, to present the Maman Shujaa’s vision for stewarding the planet’s second largest rainforest. This entry was posted on Tuesday, August 27th, 2013 at 8:01 pm	and is filed under News. You can follow any responses to this entry through the RSS 2.0 feed. You can trackback from your own site.